Do you know what today is? 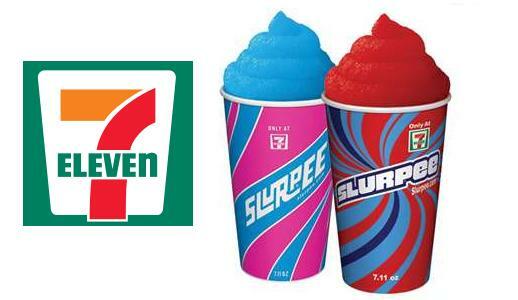 It's July 11th or otherwise known as seven-11 day (7/11), so Happy 7-Eleven Day! Yes, the convenience store that brought us the slurpee and the famed Big Gulp is celebrating its self-appointed birthday today by giving out a free 7.11 oz slurpees from 11am to 7pm. I know I can't think of a better way to enjoy the warm weather than having a nice cool, refreshing, Coke flavored (my favorite slurpee flavor!) slurpee which I enjoyed many a time as a kid...Oh thank Heaven!